Tisno was named after the Croatian word Tisno which means strait, which describes its location at the narrow strait separating the island of Murter from the mainland. 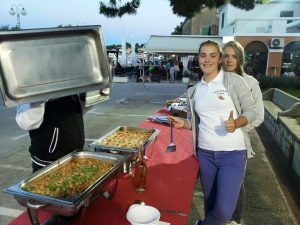 The municipality extends both to several other villages on the island as well as several nearby villages inland. 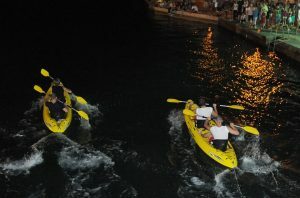 In the 2011 census, there were a total of 1,287 inhabitants in Tisno. Tisno was first mentioned in 1474 during the Turkish invasion and during the war against the Venetians when numerous refugees fled to Tisno to seek shelter. Tisno has a memorial-site dedicated to Croatian civilians killed and dropped into a local pit in the aftermath of World War II by the communist Yugoslav regime. Estimates of the number of people killed are in the range of a couple hundred. Many historical sites tell us about the settlement of this area. The remnants of a Roman villa in Ivinj date back to the 1st AD. The site was awarded the status of a protected cultural monument. The parish church of St.Spirit’s from 1548 was renewed in baroque style in 1640 and enlarged in 1840. The church tower was built in 1684 by the local architects. The church of Our Lady of Caravaggio is a votive church of the Italian family of Gelpis built at the beginning of the 18th century. Each year on 26 May, thousands of pilgrims come from all over the world. 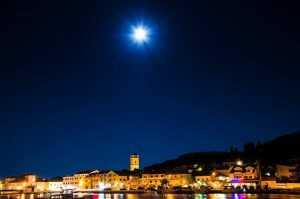 Tisno has incredible Dalmatian stone houses and narrow streets, wide squares and widespread Mediterranean vegetation along with a long seafront and many traditional restaurants make Tisno an enjoyable environment. Tisno is situated partly on mainland and partly on Murter island. What separates them is a small bay, only 38 meters wide. It is the youngest island resort. Connection between land and island is a mechanical bridge that opens twice a day during summer season. 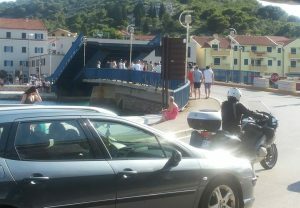 Local people started constructing a bridge right after the breakdown of Republic of Venice but soon after they started, local people from other villages protested against it and building the bridge was once again put off. However, constructing started soon again and the bridge was finally finished and remains as it today. 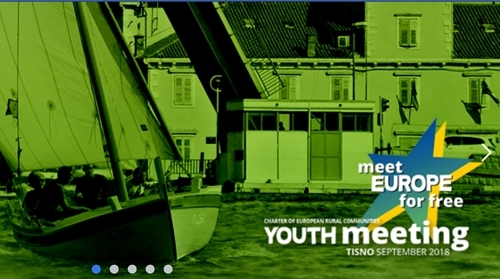 What needs to be pointed out is that Tisno had municipal government from 1808 until 1962 when Šibenik County took over. But, after Croatia became independent country in 1993, authority has been established again. 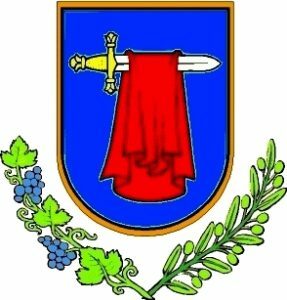 Other villages became a part of Tisno borough until 1997 and 2000 when Pirovac and Murter extracted. In 19th and 20th century Tisno was centre of administration as well as trade and dealership, particularly between two world wars. More traditional activities were vine and olive cultivation. Tisno was also the first village to open up to tourist activities which resulted organized tourist visits and opening boarding houses and a hotel. Tisno today is much different. Although it is still a centre of administration, trade and dealership it is not as emphasized. Local population is still engaged in agriculture but with minimal results. On the other hand, tourism is main activity. Tisno has hotels, apartments, luxury rooms and camps. New regional plan is to include some interesting localities turning them into apartment villages, eco sections and auto-camps. 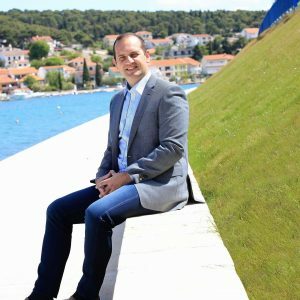 Jazina and Rastovac zone is in plan for building hotels while Luka cove and east side of Tisno are predicted to become nautical marina. Significant resource is therapeutic mud at the Makirina cove and that is important for improving health tourism. Amongst historical mouments the old bridge was built at the beginning of 18th century and was replaced with mechanical bridge in 1968. It is the only connection between the island and the mainland. The bridge was reconstructed many times. It used to open manually and sideways. Frequent transportations were donkeys that were sometimes afraid to cross because of the gap between the boards. Veneration of Our Lady of Karavaj at the shrine began in Italy in 1432 on May 26th in town Caravaggio near Bergamo when apparition occurred. Woman called Ivanica saw Our Lady. During 17th and 18th century many Italian families moved from Bergamo to Tisno. Among them was family Gelpi who brought a picture of Our Lady. They built a small chapel on hill Brošćica in 1720 and owned the chapel for more than 250 years when they decided to hand it over to the local district along with its terrain and votive gifts. 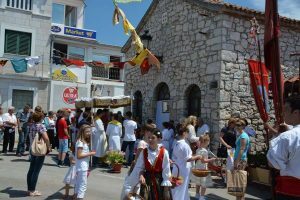 On the same date every year Tisno celebrates The Feast of Our Lady of Karavaj by organising pilgrim’s journey. Church of the Holy Spirit is the oldest. It was built in 1548 and renovated in the baroque style in 1640. The beautiful bell tower was built in 1680 by the local craftsmen. At the main altar of Holy Spirit, sanctified in 1548, stands an early gothic statue of Virgin Mary with child. This statue is unique in Europe because it is covered with silver and gold. Due to its value, it is often displayed at different exhibitions around the world. Church also has three scripted tombs. Archaeological excavations at the church of Saint Martin revealed the walls of villa complex dating back to the 2nd and 3rd century. Furthermore, remains of basilica from the 5th century, altar, early Christian baptistery and 900 tombs from the 15th century have been found. Archaeologists are still searching this area for a cemetery. During 18th century wealthy families from Italy moved to Tisno and adapted well. Eleven villas remain from that time; a house of Gelpi family (18th century), house of Banchetti family (18th century), house of Kaleb family (19th century), villa Mazzura (19th century), palace Katunarić (administration of Tisno borough). Local pharmacy is located in villa Meštrov and the medical facility was later built in villa’s garden. The garden has been transformed into a beautiful baroque park where you can sit, relax and enjoy comfortable surroundings. St. Rocco’s church (13m×8.6m) is located on the coast of Tisno called Rat and it was built around 1651. The belfry’s form is typical for this era. The main altar used to have a picture of Our Lady with St. Anthony of Padua and St. Theresa. On the main altar’s right side used to be an altar of Our Lady of the Rosary. There are two votive days; first votive day is celebrated on January 1st; second votive day is at January 27th and celebrates extermination of plague (1691). Plague again appeared at August 8th and killed 688 people. St. Andrew’s church (10m×6.3m) was built at 1606. It is located on the hill in the southern part of the island. Altar has an image of the saint signed by Ant Alborghetti Dilettante dating back to 1878. Possessions of this church were taken by French government in 1809. Church has been completely renovated.